The positive energy in the room was almost palpable as over 300 community leaders and members representing many different faith communities gathered together at the annual Nehemiah Public Meeting to celebrate the work for social justice that has happened through “Action of Greater Lansing.” People clapped and hollered in approval as leaders of the task forces, including Community of Christ Seventy Glenn Ashley, reported the fruits of their efforts in the areas of civil rights for immigrants, housing, education, children’s health, and accessibility for people with disabilities. People were also cheering loudly for the Community of Christ Singers and the songs they sang. Action of Greater Lansing is a coalition of more than 16 congregations and community organizations in the Lansing area that work together to “address root causes of community problems by advocating for systemic change.” The Capital Area Community of Christ is a member congregation and had an opportunity to host a meeting for pastors and leaders earlier this year. Songs from Community of Christ Sings with a focus on peace and social justice were selected as gathering hymns. The selections were seen as bold and inspiring and the Community of Christ was asked if they would put together a choir for the public meeting. The choir, made up primarily of members from the Capital Area Community of Christ, Charlotte Community of Christ, and Rose Lake Community of Christ, was directed by Journey House resident manager Abi Fangboner and kicked off the Nehemiah Meeting by singing “For Everyone Born” and “Let Justice Roll Like a River.” As people were filing out after the event, somebody wondered if the choir might be able to sing in Spanish at their congregation. Others shared the beauty they heard in the voices and the lyrics. Perhaps most importantly, people engaged in conversation about what it means to be creators of justice and joy, compassion and peace. As I looked around the room at the close to 30 Community of Christ members spread among the hundreds of people that were there, I couldn’t help but feel proud of my faith community. Here we were gathered together, young and old, woman and man, with various backgrounds, beliefs, and abilities, to take a public stand for social justice. I was inspired by the many that have gone before me to set pathways for peacemaking and challenging of unjust actions. I felt a sense of hope and excitement for future endeavors in Lansing, the United States, and the world. 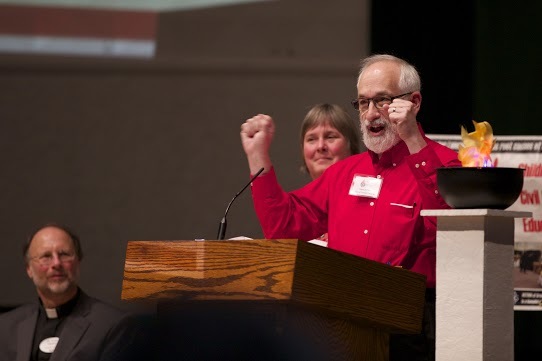 What will happen as we continue to boldly sing our faith, make connections with ecumenical groups and take actions that strengthen the community? I look forward to continuing to take part in efforts that seek to abolish poverty, end suffering, and pursue peace and to continue to be inspired by stories of others who are doing the same. As we gathered together at the Nehemiah Public Meeting I was reminded that Christ’s Mission is a mission for all of us.